The joint ESA-Roscosmos ExoMars 2016 mission is a week away from arriving at Mars in an effort to answer important astrobiological questions. While the mission’s Schiaparelli demonstrator will focus on testing landing technologies, one of its scientific instruments will be in the right place at the right time to investigate the planet’s intense dust storms. 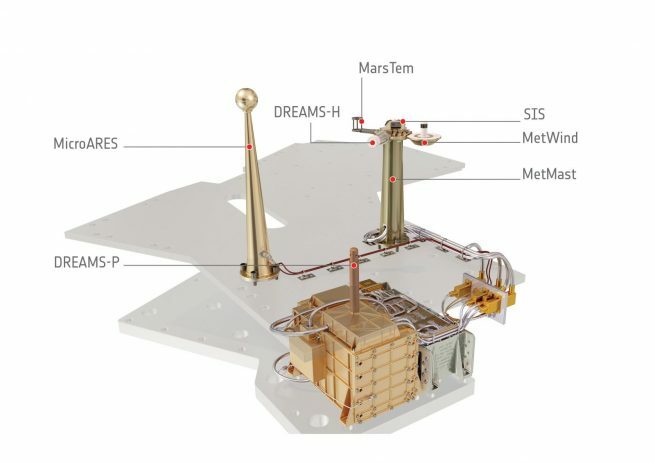 The ExoMars 2016 mission consists of two components: the Trace Gas Orbiter (TGO) that will search for evidence of methane and other minute atmospheric gases, and the Schiaparelli lander – an entry, descent, and landing demonstrator module. On Oct. 16, the lander portion will separate from TGO. It is scheduled to enter the then Martian atmosphere a few days later on Oct. 19 for a 6-minute descent ending in a landing in Meridiani Planum. Mars only possesses about one percent of the atmosphere that Earth does and the Red Planet’s atmosphere is comprised mostly (95 percent) of carbon dioxide. While TGO will commence its science mission at the end of 2017 following a year of carrying out complex aerobraking maneuvers around Mars to circularize its orbit, Schiaparelli is expected to be on duty immediately after entry into the Martian atmosphere, collecting data during the automated descent and landing. After landing, Schiaparelli is slated to activate its Dust Characterisation, Risk Assessment, and Environment Analyser on the Martian Surface (DREAMS), which could provide important insights on the nature of intense dust storms that periodically occur on the planet. The DREAMS station includes a set of sensors designed to measure wind speed and direction (MetWind), humidity (DREAMS-H), pressure (DREAMS-P), atmospheric temperature close to the surface (MarsTem), the transparency of the atmosphere (Solar Irradiance Sensor, SIS), as well as atmospheric electrification (Atmospheric Radiation and Electricity Sensor; MicroARES). In general, ExoMars scientists hope DREAMS will provide measurements of the concentration of atmospheric dust, which could yield new results regarding the role of electric forces on dust lifting, the trigger for these storms. Martian storms could be very powerful when the planet reaches its perihelion as sunlight striking the surface will be 20 percent more intense than the annual average. While global dust storms on Mars are difficult to predict exactly, scientists forecast call for severe dust events in late October 2016 when the Red Planet will be at its closest point to the Sun, coinciding with Schiaparelli’s arrival. “Now is the dust storm season, the time of the Martian year when the atmospheric dust content is highest. We may even encounter a dust storm, which would be great for science,” Vago said. Currently, less than a week ahead of landing, Schiaparelli is in excellent health. In early October, teams uploaded the last bits of software prior to the planned separation of the module from TGO. They also conducted simulations on the ground using the Avionic Test Bench (ATB) to prepare the operations group for activities after Mars orbit insertion.